Decades of studies indicate that serious health issues (including but not limited to asthma, cancer, and infertility) are on the rise and are due in some part to our ongoing exposure to toxic chemicals—whether it’s in the shower, on our commute, while we eat lunch at a local restaurant, or when we clean our kitchens at home. There are more than 80,000 chemicals on the market today. Many don’t have any safety data. This is particularly true of those used in the skin care and beauty industry. At Beautycounter, we've committed to a health and safety standard that goes well beyond what is legally required in the United States. 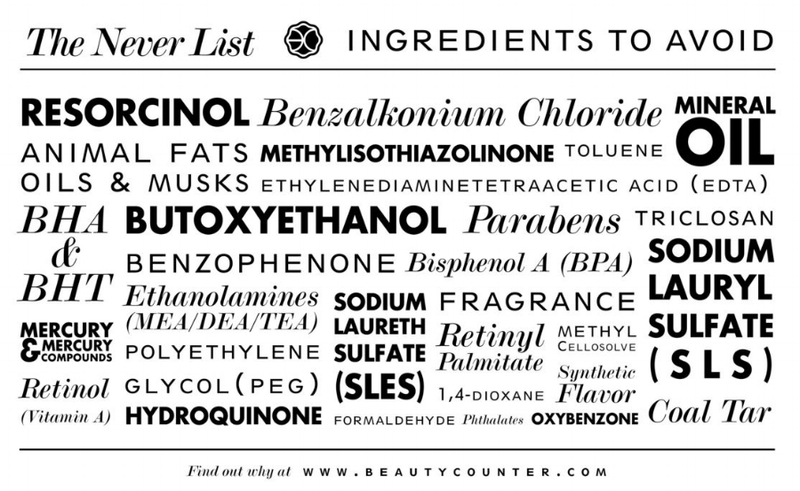 The Never List™ is made up of more than 1,500 questionable or harmful chemicals that we never use as ingredients in our products. Herbal Synergy is designed to restore balance and order to the nervous system and reinforce the hypothalamus-pituitary- adrenal branch of the endocrine system under the stresses of modern living. Due to the wide-ranging beneficial effects of its many botanical constituents, Herbal Synergy not only helps to alleviate the exhaustion imposed by daily stress, but may also improve the functional imbalances in the nervous system that restrict personal freedom and joy in LIVING. Matcha contains L-Theanine, an amino acid that helps your body to process caffeine differently and create a state of calm alertness. While one serving ofmatcha has much less caffeine than coffee, it provides a less jittery, more sustained energy boost – with no crash at the end.Matcha Green Tea powder contains a unique, potent class of antioxidant known as catechins, which aren't found in other foods. In particular, the catechin EGCg (epigallocatechin gallate) provides potent cancer-fighting properties. Reishi is recommended as an adaptogen, immune modulator, and a general tonic. Red Reishi is also used to help treat anxiety, high blood pressure, hepatitis, bronchitis, insomnia, and asthma. Reishi mushroom, or Ganoderma lucidum, is a staple of Eastern medicine. It's Chinese name, ling chih, means "mushroom of immortality." Those drinking the teacontinuously for two months report significant improvements in their well-being. One of reishi's active ingredients, polysaccharides, is water-soluble.